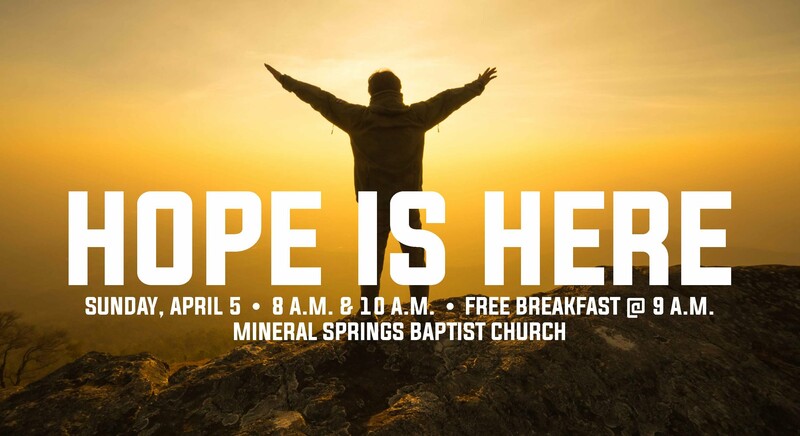 "HOPE IS HERE" Come hear the good news of hope with us on EASTER SUNDAY. These days hope can be hard to fine. With the world at unrest, economic issues and daily stress, it is hard to believe that you can have everlasting hope. At Mineral Springs Baptist Church, we have found a reason to have hope for a brighter future; and it's not dependent on you and me, but on something bigger. So come join us and hear the GOOD NEWS that can give you REAL HOPE! Sunday April 5th. The morning will include two services, 8:00am and 10:00am, with Free breakfast being served between the two at 9:00am. Special musical guest will be family singing trio, "The Littles", from Monroe, NC. Child Care will be provided. Park assistance available.